Lee Ann Celebrates 20 Years - Mark T. Albers, D.D.S. As you know from our July 23 blog post, this is a year of staff anniversaries – Michele in July and now Lee Ann as of September 21. We appreciate our staff! Lee Ann has anchored our hygiene staff for 20 years. Long time patients will remember hygienist Sharon, who left our practice when she moved to Australia. When she left, another staff member mentioned to Lee Ann that a hygiene position was opening up, and the rest is history. 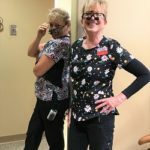 One of the things we appreciate about Lee Ann, in addition to the wonderful care she provides to our patients, is how much fun she is. You will often hear laughter coming from her operatory, in the hallway in between patients, or at dental conventions, as you can tell from the above photo. Originally from Georgia (as you know if you have talked to her), she and husband Bill enjoy traveling, spending time with friends, and caring for the bloodhounds they rescue. It’s hard to believe it’s been 20 years since Lee Ann decided to join our office. To repeat what we said at Michele’s anniversary – we’ve always said that one reason for our success is our staff. We value the long-standing relationships developed over many years between our staff and our patients. And, patients appreciate coming to an office where they are known and valued. Our goal is always to make our patients feel at home when they visit our office. When you’ve seen the same smiling face for 20 years, it’s easy to feel at home. Lee Ann is a valued member of our staff. We hope you will tell her congratulations on her 20 year anniversary the next time you’re in our office.